Click on a Point of interest to learn more. Architecturally magnificent, Petco Park, home of the San Diego Padres, opened in downtown San Diego in 2004 and immediately became known as “The world’s best ballpark in America’s finest city” …but it is so much more. Offering stunning views of San Diego Bay and the San Diego skyline, a dazzling array of venue options, state-of-the-art amenities, a dedicated event management team, and endless creative possibilities. Petco Park is the ultimate setting for an unforgettable event. The Gaslamp Quarter is home to more than 125 restaurants, coffeehouses and nightclubs. or after any PETCO Park event. With more than 50 diverse shops, 17 unique eateries and outdoor entertainment, this 14 acre waterfront complex includes a lagoon, a carousel, and a marina – the perfect place for family fun! Balboa Park is the nation’s largest urban cultural park. This must-see attraction is home to 15 major museums, beautiful gardens and the world famous San Diego Zoo. Located in the historic Gaslamp Quarter across from the Convention Center, the Omni San Diego Hotel is connected to PETCO Park via a pedestrian skywalk. This San Diego Hotel is located two blocks from the San Diego Convention Center and is adjacent to PETCO Park. The Hard Rock Hotel is strategically located across the street from the San Diego Convention Center, one block from PETCO Park and at the entrance of the hip historic Gaslamp Quarter. 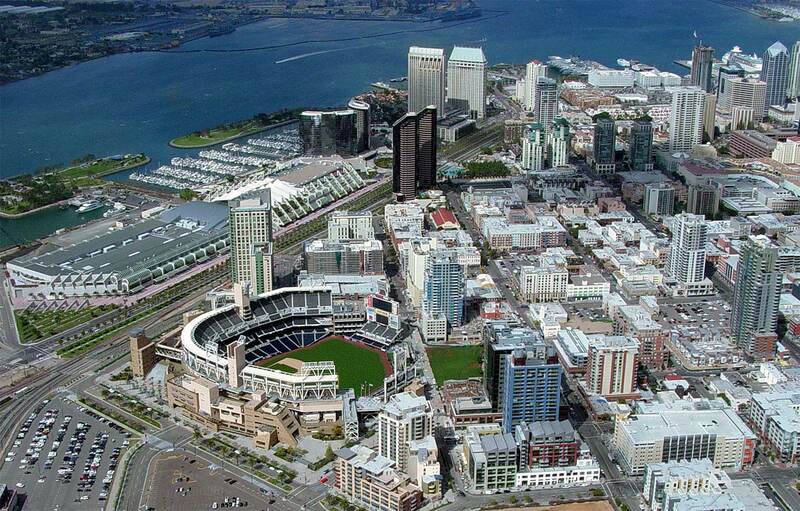 Hotel Solamar is located just steps away from PETCO Park and three blocks from the San Diego Convention Center. © 2019 Petco Park Events.